Marin runners have been pioneers in raising the bar on the possibilities of athletic achievement. Marion Irvine, followed by Shirley Matson and Melody-Anne Schultz, completely altered traditional views regarding women over 50, 60 and 70. Reilly Johnson won the Dipsea at age 8, and Steve Lyons and Lori Cohen somehow finished the grueling race while in the throes of Lou Gehrig’s Disease. Sam Hirabayashi transformed age 80 into the “new 50.” Now Corte Madera’s Clara Horowitz Peterson is changing perceptions of training during pregnancy. Clara, 29, turned heads at the Marin Memorial 5K (May 27) when, wearing only a racing top and shorts though obviously pregnant, she ran a time of 18 minutes, 12 seconds, or 5:52 per mile. Only four runners, male or female, were faster. Her protruding abdomen was even more obvious when she blazed a 5:18 at the San Rafael Mile in July. Clara had run hard through two earlier pregnancies, with Ramsey, 4, and Riley, 2, including a 7-miler the very day before each birth. Now, with a due date of Nov. 20, Clara is still training with elite runners such as Chelsea Reilly, who won the Marin Memorial 10K in a course record, Dipsea winner Brian Pilcher and Olympic Trials marathoner YiOu Wang. Though she’s gradually cutting back her mileage and pace as her pregnancy advances, 8-9 milers replacing 20-mile runs, and 6:30 miles now 7:30, Clara is definitely not jogging. “There is new thinking about exercising rigorously during pregnancy,” Peterson said. “The consensus now is that it’s fine if you’d been doing it a high level before and there are no complications. It might even be bad to stop. Clara most certainly meets the high level test, possibly the most decorated open woman runner ever to have lived and trained in Marin. At Head-Royce — Clara grew up in Berkeley and went to East Bay schools — she won four state high school titles, three in cross country and one in track. Several of her Bay Counties League records still stand. She was a five-time All-American at Duke, and twice finished second at collegiate national championships (5,000 meters indoors, 10,000 meters outdoors). After college, she became a professional runner, sponsored by Saucony and coached by 2008 Olympic marathoner Magdalena Lewy-Boulet (wife of ex-Drake High star Richie Boulet). Clara was 16th at the 2012 Olympic Trials marathon and won both the San Jose and the Great Half (San Francisco) half marathons. Clara’s husband, Jeff Peterson, also a top competitor who ran the fastest actual time in the 2008 Double Dipsea and athletic director at San Francisco’s Town School, is fully supportive. His sister even pitches in with babysitting when Clara is running. Clara is not planning on much of a rest after childbirth. She aims to race in the United States Half Marathon championships in Houston on Jan. 29. After that, she’s looking at the national 15K championships in the spring, then a sub-2:30 marathon in the fall. All roads lead to the Olympic Marathon Trials in 2016, and a berth on the U.S. team. Clara will be 32, in her prime, during the 2016 Olympic Games. She just may achieve her ultimate goal, to run the Olympic Marathon through the streets of Rio de Janeiro. Clara Peterson of Corte Madera, California, is a mom of three kids — ages 5, 3 and 11 months — and an elite runner who trained through all three of her pregnancies. Now 30, she is due in May with her fourth child and continues to run daily. 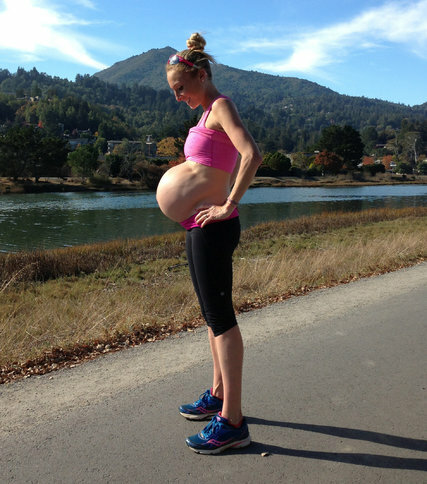 She explains why pregnancy and motherhood does not stop the runner within. I have been running since I was a fourth grader in Berkeley, California, and started training seriously in high school. I won my first of four state championships my sophomore year. And then went on to compete at the national level at Duke University and always planned to pursue a career in elite racing. The first five minutes of warm up are always uncomfortable, whether you’re pregnant or not, says Clara, seen here in one of her earlier pregnancies. “But after that passes, you get in the rhythm. You feel great,” says Clara Peterson. My normal training regimen usually consists of 70 to 90 miles per week, with intense intervals as fast as 5 minute pace per mile. I have run two marathons , the first at the Olympic trials in 2012, eight months after my second child was born. And I ran the California International marathon last year. But I prefer local road races that are shorter. I don’t get on a starting line unless I’m going to run fast. There is no elite women runner out there who trains the same way when pregnant. During pregnancy, mileage comes down, and the intensity comes down. I average 40 to 60 miles a week. If I do 400 meter intervals, I’ll do them at a slower than normal pace. I don’t like getting my heart rate up for more than 3 minutes at a time. 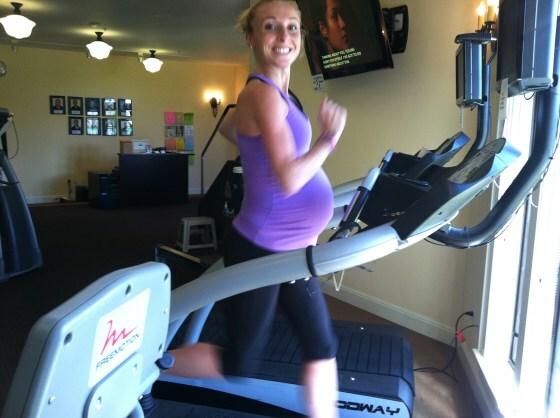 It’s definitely more uncomfortable to run while pregnant. The strangest part — especially as you get further along— is the sensation of having the uterus, which is filled with that 6- to 7-pound child, on top of your bladder, and trying to run with it. It’s not really pain — just discomfort, from the pounding. I consider pregnancy a break from elite training and my goal is to decondition as slowly as possible. So by the end of this pregnancy, at nine months, I’ll try to pull off a 6 mile run at a 7 to 8 minute-per-mile pace. At the end of my first pregnancy I was running much slower, at a 8:30 pace. The essay was written with the help of TODAY.com editor Kavita Varma-White. Clara Horowitz Peterson is an elite distance runner who has continued to train and compete during her pregnancies, running right up until her baby’s delivery in one case.